Jacky Tsila Grew up in Hazyview, a town on the border of the Kruger National Park in Mpumalanga. He completed his schooling at Sibukosetfu High School in 1996 when he matriculated. After schooling, Tsila did a Diploma in Tourism and followed this with working in hotels in the Hazyview area. Hazyview is a popular holiday destination. In 2005 Tsila joined The Artists’ Press as a press assistant. He enjoys working with people and through interactions with all the people that come to the studio, he comments that he has learnt a lot. “I feel motivated when I see people like Robert Hodgins, it is amazing to have that kind of energy at that age”. Judith Mason encouraged him by giving him books to read and he is fascinated by the kaleidoscope of people that he has met. He elaborates “people like Ditiro Makwena. He told me a lot of things about witchcraft and traditional life back in Botswana, in his slow quiet manner of storytelling”. Jacky Tsila is a gentle giant in the studio, he towers over the rest of us and is always calm and totally in control of the situation, whether it be demanding artists, a monkey in the trees outside the workshop or ten people suddenly arriving and in need of a strong cup of tea. He enjoys being a father and is dedicated to his family enjoying the fact that “I live in peace and share everything with them”. Tsila is fascinated by politics and follows the local and national scene carefully, “it is a good subject, it makes your mind grow as you learn how people are doing things”. He is concerned that people are more interested in making money out of their political positions at the moment than in making sure that there is the effective delivery of basic services; “everyone is shouting to make money”. 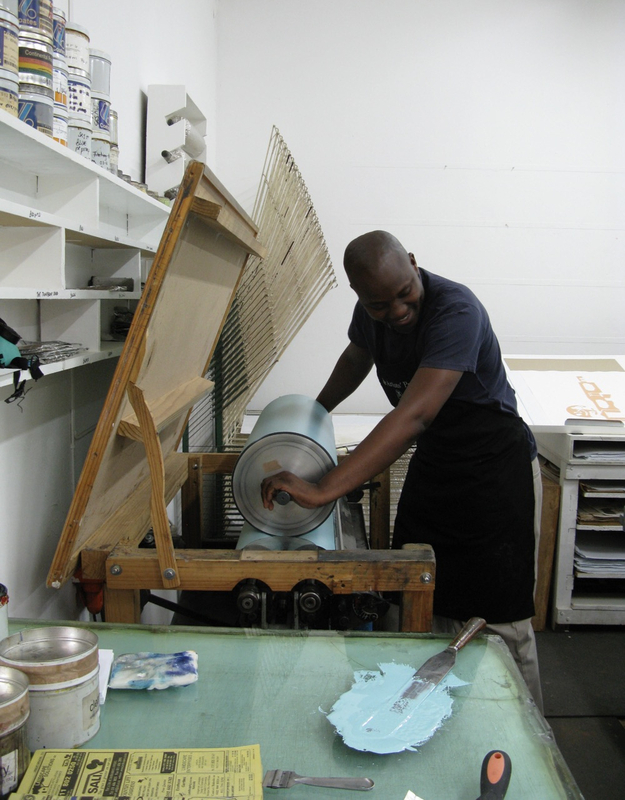 During 2014 Jacky Tsila started his training as a master printer under the guidance of Jill Graham a Tamarind Printer of note. We were lucky to have her in the studio and she was able to impart some of the skills that Tamarind teaches so well. Mark Attwood is continuing where Jill left off and it is great to see our editioning printer's confidence and skills growing on a daily basis.